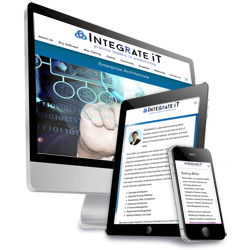 Project scope: Integrate iT is dedicated to building better business solutions. Their proven track record, of applying practical methods, techniques, and tools reduce IT transformation risk and improve business value. 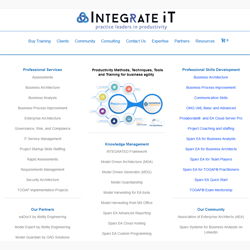 Founded in 2001, Integrate iT has worked with 110 of the Fortune 500 companies, completed over 1,100 business modeling and IT alignment assignments, and trained over 5,000 business architects, business analysts, enterprise architects, and software engineers. Integrate iT follows a proven approach that is efficient for all stakeholders across many business sectors and Architecture Landscapes. They maintain their good reputation of empowering clients with expert consulting, professional services, and training services. Design components: Integrate iT's old site was poorly designed initially and continued on that path with extremely poor functionality and maintenance of their products and a redesign and coding was necessary. The old site was taking way too long to maintain and it was on an older WordPress platform and could not easily be updated. We designed a new site using some parallax pages and then expanded some of it's components to the rest of the site, making adjestments as necessary to create the new individual pages. The final coding was then integrated into the Big Commerce platform shoping cart with full payment, banking and accounting integration and conversion to multiple languages.